Pain is the chairman of Akatsuki and was a runaway ninja who comes from Amegakure. Akatsuki is the name of a criminal organization in Naruto series. Still in our special theme this time,”Special Naruto Template“, we would like to introduce the characters in the manga and anime series Naruto, both antagonists and protagonists. Pain Including this, which is the antagonist. Yet the character of Pain as evil become something interesting separate from this story. 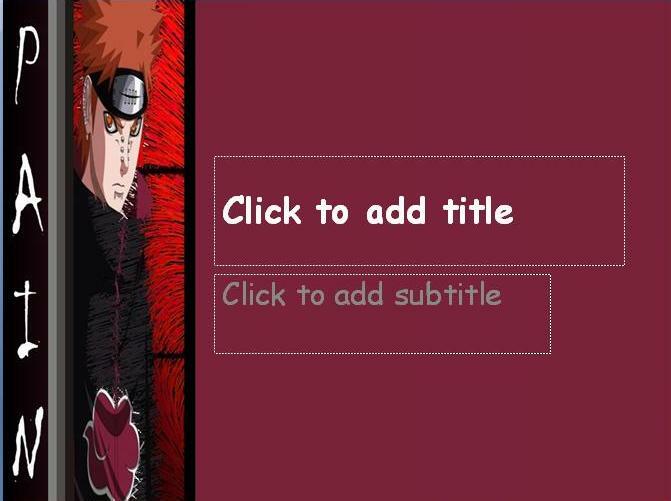 Although this template is using the anime-themed background, this template is made very simple in order to facilitate users when to apply them in a variety of presentation themes.